You've got sensitive information on a hard disk that requires decommissioning. Every day you hear more about identity theft, security compliance, and cyber criminals trying to obtain your private information. If you throw the disk in the dumpster, who knows what might happen to all those credit card and social security numbers. Imagine your liabilities. What should you do? Crush your decommissioned disks with the Hard Disk Crusher. 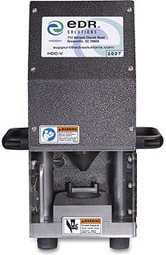 Download our 1 page .PDF Spec Sheet of the Hard Disk Crusher. Download... NOT READY TO PURCHASE? You can just rent the HDC for as long as you need it. Not sure about something? Please ask away using our contact form.